Yelberton Abraham Tittle Jr. (born October 24, 1926), better known as Y.A. Tittle, is a former professional American football quarterback. He played in the National Football League (NFL) for the San Francisco 49ers, New York Giants, and Baltimore Colts, after spending two seasons with the Colts in the All-America Football Conference (AAFC). [lower-alpha 1] Known for his competitiveness, leadership, and striking profile, Tittle was the centerpiece of several prolific offenses throughout his seventeen-year professional career from 1948 to 1964. Tittle played college football for Louisiana State University, where he was a two-time All-Southeastern Conference (SEC) quarterback for the LSU Tigers football team. As a senior, he was named the most valuable player (MVP) of the infamous 1947 Cotton Bowl Classic—also known as the "Ice Bowl"—a scoreless tie between the Tigers and Arkansas Razorbacks in a snowstorm. After college he was drafted in the 1947 NFL Draft by the Detroit Lions, but he instead chose to play in the AAFC for the Colts. With the Colts, Tittle was named the AAFC Rookie of the Year in 1948 after leading the team to the AAFC playoffs. After back-to-back one-win seasons, the Colts franchise folded, which allowed Tittle to be drafted in the 1951 NFL Draft by the 49ers. Through ten seasons in San Francisco, he was invited to four Pro Bowls, led the league in touchdown passes in 1955, and was named the NFL Player of the Year by the United Press in 1957. A groundbreaker, Tittle was part of the 49ers' famed "Million Dollar Backfield", was the first professional football player featured on the cover of Sports Illustrated, and is credited with coining "alley-oop" as a sports term. Considered washed-up, the 34-year-old Tittle was traded to the Giants following the 1960 season. Over the next four seasons, he won three MVP awards, twice set the league single-season record for touchdown passes, and led the Giants to three straight NFL championship games. Although he was never able to deliver a championship to the team, Tittle's time in New York is regarded among the glory years of the franchise. In his final season, Tittle was photographed bloodied and kneeling down in the end zone after a tackle by a defender left him helmet-less. The photograph has become one of the most iconic images in North American sports history. He retired as the NFL's all-time leader in passing yards, passing touchdowns, attempts, completions, and games played. He was inducted into the Pro Football Hall of Fame in 1971. Tittle's jersey number 14 was retired by the Giants, and he was a charter member of both the New York Giants Ring of Honor and the San Francisco 49ers Hall of Fame. Born and raised in Marshall, Texas, Yelberton Abraham Tittle aspired to be a quarterback from a young age. He spent hours in his backyard throwing a football through a tire swing, emulating his neighbor and boyhood idol, Sammy Baugh. Tittle played high school football at Marshall High School. In his senior year the team posted an undefeated record and reached the state finals. After a recruiting battle between Louisiana State University and the University of Texas, Tittle chose to attend LSU in Baton Rouge, Louisiana and play for the LSU Tigers. He was part of a successful 1944 recruiting class under head coach Bernie Moore that included halfbacks Jim Cason, Dan Sandifer, and Ray Coates. Freshmen were eligible to play on the varsity during World War II, so Tittle saw playing time immediately. He later said the finest moment of his four years at LSU was beating Tulane as a freshman, a game in which he set a school record with 238 passing yards. It was one of two games the Tigers won that season. Moore started Tittle at tailback in the single-wing formation his first year, but moved him to quarterback in the T formation during his sophomore season. As a junior in 1946, Tittle's three touchdown passes in a 41–27 rout of rival Tulane helped ensure LSU a spot in the Cotton Bowl Classic. Known notoriously as the "Ice Bowl", the 1947 Cotton Bowl pitted LSU against the Arkansas Razorbacks in sub-freezing temperatures on an ice-covered field in Dallas, Texas. LSU moved the ball much better than the Razorbacks, but neither team was able to score, and the game ended in a 0–0 tie. Tittle and Arkansas end Alton Baldwin shared the game's MVP award. Following the season, United Press International (UPI) placed Tittle on its All-Southeastern Conference (SEC) first-team. UPI again named Tittle its first-team All-SEC quarterback in 1947. In Tittle's day of iron man football, he played on both offense and defense. While on defense during a 20–18 loss to SEC champion Ole Miss in his senior season, Tittle's belt buckle was torn off as he intercepted a pass from Charlie Conerly and broke a tackle. He ran down the sideline with one arm cradling the ball and the other holding up his pants. At the Ole Miss 20-yard line, as he attempted to stiff-arm a defender, Tittle's pants fell and he tripped and fell onto his face. The fall kept him from scoring the game-winning touchdown. In total, during his college career Tittle set school passing records with 162 completions out of 330 attempts for 2,525 yards and 23 touchdowns. He scored seven touchdowns himself as a runner. His passing totals remained unbroken until Bert Jones surpassed them in the 1970s. Tittle was the sixth overall selection of the 1948 NFL Draft, taken by the Detroit Lions. However, Tittle instead began his professional career with the Baltimore Colts of the All-America Football Conference in 1948. That season, already being described as a "passing ace", he was unanimously recognized as the AAFC Rookie of the Year by UPI after passing for 2,739 yards and leading the Colts to the brink of an Eastern Division championship. After a 1–11 win–loss record in 1949, the Colts joined the National Football League in 1950. The team again posted a single win against eleven losses, and the franchise folded after the season due to financial difficulties. Players on the roster at the time of the fold were eligible to be drafted in the next NFL draft. Tittle was then drafted by the San Francisco 49ers in the 1951 NFL Draft after the Colts folded. 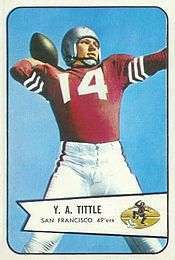 While many players at the time were unable to play immediately due to military duties, Tittle had received a class IV-F exemption due to physical ailments, so he was able to join the 49ers roster that season. In 1951 and 1952, he shared time at quarterback with Frankie Albert. In 1953, his first full season as the 49ers' starter, he passed for 2,121 yards and twenty touchdowns and was invited to his first Pro Bowl. San Francisco finished with a 9–3 regular season record, which was good enough for second in the Western Conference, and led the league in offensive points scored. 1954 saw the 49ers compile their Million Dollar Backfield, a backfield composed of four future Hall of Famers: Tittle; fullbacks John Henry Johnson and Joe Perry; and halfback Hugh McElhenny. "It made quarterbacking so easy because I just get in the huddle and call anything and you have three Hall of Fame running backs ready to carry the ball," Tittle reminisced in 2006. The team had aspirations for a championship run, but injuries, including McElhenny's separated shoulder in the sixth game of the season, ended those hopes and the 49ers finished third in the Western Division. Tittle starred in his second straight Pro Bowl appearance as he threw two touchdown passes, including one to 49ers teammate Billy Wilson, who was named the game's MVP. Tittle became the first professional football player featured on the cover of Sports Illustrated when he appeared on its fifteenth issue dated November 22, 1954, donning his 49ers uniform and helmet featuring an acrylic face mask distinct to the time period. The cover photo also shows a metal bracket on the side of Tittle's helmet which served to protect his face by preventing the helmet from caving in. 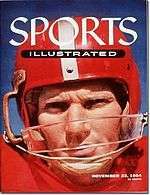 The 1954 cover was the first of four Sports Illustrated covers he graced during his career. Tittle led the NFL in touchdown passes for the first time in 1955, with 17, while also leading the league with 28 interceptions thrown. When the 49ers hired Frankie Albert as head coach in 1956, Tittle was pleased with the choice at first, figuring Albert would be a good mentor. However, the team lost four of its first five games, and Albert replaced Tittle with rookie Earl Morrall. After a loss to the Los Angeles Rams brought San Francisco's record to 1–6, Tittle regained the starting role and the team finished undefeated with one tie through the season's final five games. In 1957, Tittle and receiver R. C. Owens devised a pass play in which Tittle tossed the ball high into the air and the 6 ft 3 in (1.91 m) Owens leapt to retrieve it, typically resulting in a long gain or a touchdown. Tittle dubbed the play the "alley-oop"–the first usage of the term in sports–and it was highly successful when utilized. The 49ers finished the regular season with an 8–4 record and hosted the Detroit Lions in the Western Conference playoff. Against the Lions Tittle passed for 248 yards and tossed three touchdown passes—one each to Owens, McElhenny, and Wilson—but Detroit overcame a twenty-point third quarter deficit to win 31–27. For the season, Tittle had a league-leading 63.1 completion percentage, threw for 2,157 yards and thirteen touchdowns, and rushed for six more scores. He was deemed "pro player of the year" by a United Press poll of members of the National Football Writers Association. Additionally, he was named to his first All-Pro team and invited to his third Pro Bowl. After a poor 1958 preseason by Tittle, Albert started John Brodie at quarterback for the 1958 season, a decision that proved unpopular with the fan base. Tittle came in to relieve Brodie in a week six game against the Lions, with ten minutes left in the game and the 49ers down 21–17. His appearance "drew a roar of approval from the crowd of 59,213," after which he drove the team downfield and threw a 32-yard touchdown pass to McElhenny for the winning score. A right knee ligament injury against the Colts in week nine ended Tittle's season, and San Francisco finished with a 7–5 record, followed by Albert's resignation as coach. Tittle and Brodie continued to share time at quarterback over the next two seasons. In his fourth and final Pro Bowl game with the 49ers in 1959, Tittle completed 13 of 17 passes for 178 yards and a touchdown. Under new head coach Red Hickey in 1960, the 49ers adopted the shotgun formation. The first implementation of the shotgun was in week nine against the Colts, with Brodie at quarterback while Tittle nursed a groin injury. The 49ers scored a season-high thirty points, and with Brodie in the shotgun won three of their last four games to salvage a winning season at 7–5. Though conflicted, Tittle decided to get into shape and prepare for the next season. He stated in his 2009 autobiography that at times he thought, "The hell with it. Quit this damned game. You have been at it too long anyway." But then another voice within him would say, "Come back for another year and show them you're still a good QB. Don't let them shotgun you out of football!" However, after the first preseason game of 1961, Hickey informed Tittle he had been traded to the New York Giants. In mid-August 1961, the 49ers traded the 34-year-old Tittle to the New York Giants for second-year guard Lou Cordileone. Cordileone, the 12th overall pick in the 1960 NFL Draft, was quoted as reacting "Me, even up for Y.A. Tittle? You're kidding," and later remarked that the Giants traded him for "a 42-year-old quarterback." Tittle's view of Cordileone was much the same, stating his dismay that the 49ers did not get a "name ballplayer" in return. He was also displeased with being traded to the East Coast, and said he would rather have been traded to the Los Angeles Rams. Already considered washed up, the Giants intended to have Tittle share quarterback duties with 40-year-old Charlie Conerly, who had been with the team since 1948. The players at first remained loyal to Conerly, and treated Tittle with the cold shoulder. Tittle missed the season opener due to a back injury sustained before the season. His first game with New York came in week two, against the Steelers, in which he and Conerly each threw a touchdown pass in the Giants' 17–14 win. He became the team's primary starter for the remainder of the season and led the revitalized Giants to first place in the Eastern Conference. The Newspaper Enterprise Association (NEA) awarded Tittle its Jim Thorpe Trophy as the players' choice of NFL MVP. In the 1961 NFL Championship Game, the Giants were soundly defeated by Vince Lombardi's Green Bay Packers, as they were shut-out 0–37. Tittle completed six of twenty passes in the game and threw four interceptions. In January 1962, Tittle stated his intention to retire following the 1962 season. After an off-season quarterback competition with Ralph Guglielmi, Tittle played and started in a career-high 14 games. He tied an NFL record by throwing seven touchdown passes in a game on October 28, 1962, in a 49–34 win over the Washington Redskins. Against the Dallas Cowboys in the regular season finale, Tittle threw six touchdown passes to tie the single-season record of 33 set the previous year by Sonny Jurgensen. The Giants again finished first in the Eastern Conference and faced the Packers in the 1962 NFL Championship Game. In frigid, windy conditions at Yankee Stadium and facing a constant pass rush from the Packers' front seven, Tittle completed only 18 of his 41 attempts in the game. The Packers won, 16–7, with New York's lone score coming on a blocked punt recovered in the end zone by Jim Collier. He earned Player of the Year honors from the Washington D.C. Touchdown Club, UPI, and The Sporting News. Tittle returned to the Giants in 1963 and, at age 37, supplanted the single-season passing touchdown record by throwing 36. He broke the record in the final game with three touchdowns against the Steelers, three days after being named NFL MVP by the AP. The Giants led the league in scoring by a wide margin, and for the third time in as many years clinched the Eastern Conference title. The Western champions were George Halas' Chicago Bears. The teams met in the 1963 NFL Championship Game at Wrigley Field. In the second quarter, Tittle injured his knee on a tackle by Larry Morris, and required a novocaine shot at halftime to continue playing. After holding a 10–7 halftime lead, The Giants were shutout in the second half, during which Tittle threw four interceptions. Playing through the knee injury, he completed 11 of 29 passes in the game for 147 yards, a touchdown, and five interceptions as the Bears won 14–10. The following year in 1964, Tittle's final season, the Giants went 2–10–2 (.214), the worst record in the 14-team league. In the second game of the year, against Pittsburgh, he was blindsided by defensive end John Baker. The tackle left Tittle with crushed cartilage in his ribs, a cracked sternum, and a concussion. However, he played in every game the rest of the season, but was relegated to a backup role later in the year. After throwing only ten touchdowns with 22 interceptions, he retired after the season at age 39, saying rookie quarterback Gary Wood not only "took my job away, but started to ask permission to date my daughter." Over seventeen seasons as a professional, Tittle completed 2,427 out of 4,395 passes for 33,070 yards and 242 touchdowns, with 248 interceptions. He also scrambled for 39 touchdowns. *^* In 1957, Tittle was named POTY by United Press International. In 1961, he was named MVP by the Newspaper Enterprise Association. In 1962, he was named POTY by The Sporting News and UPI. In 1963, he was named MVP/POTY by the AP, UPI, NEA & TSN. the brain of a computer. "I played with Tittle in the Pro Bowl two years ago, and I discovered he's quite a guy ... He and John, however, are entirely different types ... Tittle is a sort of 'con man' with his players ... he comes into a huddle and 'suggests' that maybe this or that will work on account of something he saw happen on a previous play ... The way he puts it, you're convinced it's a good idea and maybe it will work. John, now, he's a take-charge guy ... He tells you what the other guy's going to do, what he's going to do, and what he wants you to do." Tittle's most productive years came when he was well beyond his athletic prime. On his ability to improve with age, he credited a feel for the game that came from his years of experience in the league. "If you could learn it by studying movies, a good smart college quarterback could learn all you've got to learn in three weeks and then come in and be as good as the old heads," he told Sports Illustrated in 1963. "But they can't." Tittle was the fourth player to throw seven touchdown passes in a game, when he did so in 1962 against the Redskins. He followed Sid Luckman (1943), Adrian Burk (1954), and George Blanda (1961). The feat has since been equaled by four more players: Joe Kapp (1969), Peyton Manning (2013), Nick Foles (2013), and Drew Brees (2015). Tittle, Manning and Foles did it without an interception. His 36 touchdown passes in 1963 set a record which stood for over two decades until it was surpassed by Dan Marino in 1984; as of 2016 it remains a Giants franchise record. Despite record statistics and three straight championship game appearances, Tittle was never able to deliver a title to his team. His record as a starter in postseason games was 0–4. He threw four touchdown passes against 14 interceptions and had a passer rating of 33.8 in his postseason career, far below his regular season passer rating of 74.3. Seth Wickersham, writing for ESPN The Magazine in 2014, noted the dichotomy in the 1960s between two of New York's major sports franchises: "... Gifford, Huff and Tittle, a team of Hall of Famers known for losing championships as their peers on the Yankees—with whom they shared a stadium, a city, and many rounds of drinks—became renowned for winning them." The Giants struggled after Tittle's retirement, posting only two winning seasons from 1964 to 1980. He made seven Pro Bowls, four first-team All-Pro teams, and four times was named the NFL's Most Valuable Player or Player of the Year: in 1957 and 1962 by the UPI; in 1961 by the NEA; and in 1963 by the AP and NEA. In a sports column in 1963, George Strickler for the Chicago Tribune remarked Tittle had "broken records that at one time appeared unassailable and he has been the hero of more second half rallies than Napoleon and the Harlem Globetrotters." He was featured on four Sports Illustrated covers: three during his playing career and one shortly after retirement. His first was with the 49ers in 1954. With the Giants, he graced covers in November 1961, and he was on the season preview issue for 1964; a two-page fold-out photo from the 1963 title game. Tittle was on a fourth cover in August 1965. The trade of Tittle for Cordileone is seen as one of the worst trades in 49ers history; it is considered one of the best trades in Giants franchise history. Cordileone played just one season in San Francisco. A photo of a dazed Tittle in the end zone taken by Morris Berman of the Pittsburgh Post-Gazette on September 20, 1964, is regarded among the most iconic images in the history of American sports and journalism. Tittle, in his 17th and final season, was photographed helmet-less, bloodied and kneeling immediately after having been knocked to the ground by John Baker of the Pittsburgh Steelers and throwing an interception that was returned for a touchdown at the old Pitt Stadium. He suffered a concussion and cracked sternum on the play, but played the rest of the season. Post-Gazette editors at first declined to run the photo, looking for "action shots" instead, but Berman entered the image into contests where it took on a life of its own, winning a National Headliner Award. The photo was published in the Oct 2, 1964 issue of Life magazine. It is regarded as having changed the way that photographers look at sports, having shown the power of capturing a moment of reaction. It became one of three photos to hang in the lobby of the National Press Photographers Association headquarters, alongside Raising the Flag on Iwo Jima and the Hindenburg disaster. A copy now hangs in the Pro Football Hall of Fame. After at first having failed to see the appeal of the image, Tittle eventually grew to embrace it, putting it on the back cover of his 2009 autobiography. "That was the end of the road," he told the Los Angeles Times in 2008. "It was the end of my dream. It was over." Pittsburgh player John Baker, who hit Tittle right before the picture was taken, ran for sheriff in his native Wake County, North Carolina in 1978, and used the photo as a campaign tool. He was elected and went on to serve for 25 years. In recognition of his high school and college careers, respectively, Tittle was inducted to the Texas Sports Hall of Fame in 1987 and the Louisiana Sports Hall of Fame in 1972. Tittle was inducted into the Pro Football Hall of Fame with its 1971 class, which included contemporaries Jim Brown, Norm Van Brocklin, the late Vince Lombardi, and former Giants teammate Andy Robustelli. By virtue of his membership in the pro hall of fame, he was automatically inducted as a charter member of the San Francisco 49ers Hall of Fame in 2009. The Giants had originally retired the number 14 jersey in honor of Ward Cuff, but Tittle requested and was granted the jersey number by Giants owner Wellington Mara when he joined the team. It was retired again immediately following his retirement, and is now retired in honor of both players. In 2010, Tittle became a charter member of the New York Giants Ring of Honor. After his retirement, he rejoined the 49ers staff and served as an assistant coach before being hired by the Giants in 1970 as a quarterback mentor. During his NFL career, Tittle worked as an insurance salesman in the off-season. After retiring he founded his own company, Y.A. Tittle Insurance & Financial Services. As of 2014, Tittle resides in Atherton, California with his wife Minnette. Their daughter, Dianne de Laet, is a harpist and poet, and in 1995 she published a biography of her father titled Giants & heroes: a daughter's memories of Y.A. Tittle. Tittle currently suffers from severe dementia, which adversely impacts his memories and limits his conversation to a handful of topics. 1 2 "Y.A Tittle Bio". Pro Football Hall of Fame. Retrieved August 26, 2016. 1 2 3 4 5 6 7 8 9 10 11 12 13 "Tiger Den Archives – IX". goldenrankings.com. Retrieved August 15, 2016. 1 2 3 Vincent, Herb (2008). LSU Football Vault: The History of the Fighting Tigers. Whitman Publishing, LLC. p. 57. ISBN 0-7948-2428-5. 1 2 Finney, Peter (November 18, 2009). "Quarterback Y.A. Tittle made it look easy, even if it wasn't". The Times Picayune. Retrieved August 30, 2016. 1 2 Calhoun, Jim (1971). Louisiana Sports Record Book. Pelican Publishing. pp. 25–26. ISBN 978-1-4556-0785-3. Retrieved September 22, 2016. ↑ "Louisiana State Routes Tulane 41-27". The Sunday Morning Star. United Press. December 1, 1946. p. 24. Retrieved August 15, 2016. ↑ "1947 Classic Recap" (PDF). attcottonbowl.com. Retrieved May 21, 2016. ↑ William Tucker (November 21, 1946). "Travis Tidwell, Auburn Back, On 2nd Team". The Anniston Star. p. 16. Retrieved May 30, 2015 – via Newspapers.com. ↑ "Three Alabama Players Given Stellar Ratings". The Courier News. November 26, 1947. p. 35. Retrieved August 14, 2016 – via Newspapers.com. ↑ "Drop your pants and stumble into Hall of Shame". The Telegraph. Associated Press. May 3, 1987. p. C-12. Retrieved August 24, 2016. ↑ Casstevens, David (January 1, 1987). "Regret? Tittle would change a few things he did". Spokane Chronicle. p. C1. Retrieved August 15, 2016. ↑ "Y.A. Tittle". Louisiana Sports Hall of Fame. Retrieved November 19, 2016. ↑ "1948 NFL Draft Picks". Pro-Football-Reference.com. Sports Reference LLC. Retrieved May 21, 2016. ↑ "Motley Star As Cleve. Browns Down Colts". The Afro American. November 13, 1948. p. 8. Retrieved August 12, 2016. ↑ Coenen, Craig R. (2005). From Sandlots to the Super Bowl: the National Football League, 1920–1967. University of Tennessee Press. p. 170. ISBN 1-57233-447-9. Retrieved August 14, 2016. 1 2 Maxymuk, John (2007). Strong Arm Tactics: A History and Statistical Analysis of the Professional Quarterback. McFarland. p. 280. ISBN 0-7864-3277-2. Retrieved August 30, 2016. ↑ Sainsbury, Ed (January 19, 1951). "Professional Football Teams Draft College Stars, But Uncle Sam May Come First". The Bulletin. United Press. p. 7. Retrieved August 12, 2016. ↑ "Season Ends In Pro Bowl". Ellensburg Daily Record. Associated Press. January 16, 1964. p. 4. Retrieved August 14, 2016. ↑ "1953 San Francisco 49ers Statistics & Players". Pro-Football-Reference.com. Sports Reference LLC. Retrieved August 14, 2016. 1 2 Tameta, Andre (May 22, 2009). "San Francisco's Million Dollar Backfield: The 49ers' Fabulous Foursome". Bleacher Report. Retrieved August 14, 2016. 1 2 3 4 Fimrite, Ron (September 2, 1996). "49ers Quarterback Y.A. Tittle November 22, 1954". Sports Illustrated. 35 (10). Retrieved August 14, 2016. ↑ "Shoulder Injuries Fell Stars, Reshuffle Pro Grid Standings". Daytona Beach Morning Journal. Associated Press. November 20, 1954. p. 9. Retrieved August 14, 2016. ↑ "West Defeats East 26–19 In All-Star Bowl". Gettysburg Times. Associated Press. January 17, 1955. p. 5. Retrieved August 15, 2016. ↑ Worden, William L. (November 22, 1954). "Tittle of the 49ers". Sports Illustrated. 1 (15): 34. Retrieved August 14, 2016. ↑ Lukas, Paul. "The rich history of helmets". ESPN. Retrieved August 15, 2016. ↑ "Y.A. Tittle - SI Vault". Sports Illustrated. Time Inc. Retrieved August 17, 2016. ↑ "Frankie Albert Appointed San Francisco Head Coach". Toledo Blade. Associated Press. January 13, 1956. p. 28. Retrieved August 16, 2016. ↑ "1956 San Francisco 49ers Statistics & Players". Pro-Football-Reference.com. Sports Reference LLC. Retrieved August 16, 2016. ↑ "alley-oop, adv., int., adj., and n.". Oxford English Dictionary. Retrieved August 15, 2016. ↑ Martin, Douglas (June 19, 2012). "R. C. Owens, Receiver Who Made the Alley-Oop Famous, Dies at 77". The New York Times. Retrieved August 14, 2016. ↑ Stevenson, Jack (December 23, 1957). "Another Amazing Comeback Gives Lions 31–27 Victory". Ludington Daily News. Associated Press. p. 10. Retrieved August 16, 2016. 1 2 "Tittle, Francis Feted at Million Dollar Dinner". The Bulletin. United Press. January 29, 1958. p. 3. Retrieved August 15, 2016. 1 2 3 "UPI NFL Most Valuable Player Winners". Pro-Football-Reference.com. Sports Reference LLC. Retrieved May 23, 2016. ↑ "1957 NFL All-Pros". Pro-Football-Reference.com. Sports Reference LLC. Retrieved August 16, 2016. ↑ "West Eleven Favored in Pro Bowl Meet". The Bulletin. United Press. January 11, 1958. p. 3. Retrieved August 16, 2016. ↑ Stevenson, Jack (November 3, 1958). "Tittle Sparks San Francisco Victory". The Lewiston Daily Sun. Associated Press. p. 9. Retrieved August 17, 2016. ↑ "Unitas, Arnett, Flu Whip East Pro Stars". Beaver Valley Times. United Press International. January 18, 1960. p. 12. Retrieved August 17, 2016. ↑ "'Shotgun' inventor Red Hickey dead at 89". The Victoria Advocate. March 31, 2006. p. 3B. Retrieved August 17, 2016. ↑ "Giants get Tittle for Cordileone". Milwaukee Sentinel. UPI. August 16, 1961. p. 2-part 3. 1 2 3 Wentworth, Bridget (September 22, 2009). "Tittle didn't want Giants trade". The Star-Ledger. Retrieved August 17, 2016. 1 2 3 4 "Tittle Retires From Pro Football After 17 Seasons". Lodi News-Sentinel. United Press International. January 23, 1965. p. 7. Retrieved August 25, 2016. 1 2 Fraley, Oscar (May 11, 1962). "Today's Sport Parade". Reading Eagle. United Press International. p. 16. Retrieved August 19, 2016. ↑ Daley, Arthur (July 19, 1965). "Elements of Uncertainty". The Telegraph. p. 10. Retrieved August 19, 2016. 1 2 3 Hunt, Jim (October 24, 1964). "Who's the guy with the bald head?". The Montreal Gazette. pp. 14–15. Retrieved August 19, 2016. ↑ Sell, Jack (September 20, 1961). "Giant Wheels Hope to Roll Over Steelers". Pittsburgh Post-Gazette. p. 21. Retrieved August 23, 2016. ↑ "Steelers Lose". Herald-Journal. Associated Press. September 25, 1961. p. 7. Retrieved August 23, 2016. ↑ "Tittle Star Of Giants' Key Win; Colts Victors". The Telegraph. Associated Press. November 27, 1961. p. 10. Retrieved August 23, 2016. ↑ Olderman, Murray (December 27, 1961). "Players Name Tittle Thorpe Trophy Winner". The Telegraph. Newspaper Enterprise Association. p. 12. Retrieved August 23, 2016. 1 2 3 "Newspaper Ent. Assoc. NFL Most Valuable Player Winners". Pro-Football-Reference.com. Sports Reference LLC. Retrieved May 23, 2016. ↑ "'Soldier' Hornung Leads Driving Packers To 37–0 Humiliation of New York Giants". Spokesman-Review. Associated Press. January 1, 1962. p. 14. Retrieved August 22, 2016. ↑ Strickler, George (January 1, 1962). "Green Bay 37, New York 0!". Chicago Tribune. p. 1, part 6. Retrieved August 22, 2016. ↑ "Tittle May Retire". The Fort Scott Tribune. Associated Press. January 31, 1962. p. 7. Retrieved August 23, 2016. ↑ "Tittle's Aerials Rip Skins". The Milwaukee Sentinel. United Press. October 29, 1962. p. 3. Retrieved May 9, 2016. 1 2 "Seven TD passes in a game". profootballhof.com. Pro Football Hall of Fame. Retrieved July 30, 2016. ↑ Miller, Norman (December 17, 1962). "Hot Giants eye title". The Bulletin. United Press International. p. 2. Retrieved August 23, 2016. ↑ Strickler, George (December 31, 1962). "Packers Keep Title; Beat Giants, 16–7". Chicago Tribune. p. 1, part 3. Retrieved August 23, 2016. ↑ "Tittle Earns More Honors". Schenectady Gazette. Associated Press. December 22, 1962. p. 16. Retrieved August 29, 2016. ↑ "The Sporting News Football Almanac". Sporting News. Retrieved December 4, 2016. 1 2 "Giants Rip Steelers 33–17 Behind Tittle". Lodi News-Sentinel. United Press International. December 16, 1963. p. 13. Retrieved May 21, 2016. ↑ "Tittle Is Chosen As Most Valuable In National Loop". Associated Press. December 13, 1963. p. 16. Retrieved August 24, 2016. ↑ Strickler, George (December 30, 1963). "Bears the Champions! Win, 14–10". Chicago Tribune. p. 1, section 1. ↑ "New York Giants at Chicago Bears - December 29th, 1963". Pro-Football-Reference.com. Sports Reference LLC. Retrieved August 24, 2016. ↑ "1964 NFL Standings, Team & Offensive Statistics". Pro-Football-Reference.com. Sports Reference LLC. Retrieved May 21, 2016. ↑ "Steelers Smash New York; Tittle Given 'Good Beating'". Eugene Register Guard. Associated Press. September 21, 1964. p. 3B. Retrieved August 25, 2016. ↑ "Tittle Decides To Retire At 39". Gadsden Times. Associated Press. January 23, 1965. p. 7. Retrieved May 21, 2016. 1 2 3 "Y.A. Tittle NFL Football Statistics". Pro-Football-Reference.com. Sports Reference LLC. Retrieved August 26, 2016. 1 2 Strickler, George (December 27, 1963). "Profile of a Pro". Chicago Tribune. Retrieved August 17, 2016. ↑ Schmitt, Larry (November 4, 2013). "Y.A. Tittle's Incomparable 1962 and 1963 seasons". Big Blue Interactive. Retrieved August 26, 2016. 1 2 3 Maule, Tex (November 18, 1963). "Y. A. Tittle is the best policy". Sports Illustrated. 19 (21). Retrieved August 26, 2016. ↑ Farmer, Sam (September 12, 2002). "A Crew Cut Above". Los Angeles Times. Retrieved August 26, 2016. ↑ "Y.A. Tittle versus John Unitas". Washington Afro-American. January 28, 1964. p. 13. Retrieved August 24, 2016. ↑ Katzowitz, Josh (October 24, 1014). "A happy birthday to Y.A. Tittle, one of the best middle-aged QBs ever". CBS Sports. Retrieved August 26, 2016. ↑ "Y.A. Tittle Retires, Set Longevity Record". The Morning Record. Associated Press. January 23, 1965. p. 5. Retrieved August 26, 2016. ↑ Rappoport, Ken (December 10, 1984). "Tittle and Blanda give Marino passing marks". Gainesville Sun. Associated Press. Retrieved May 21, 2016. 1 2 3 "Giants Ring of Honor: Y.A. Tittle". New York Giants. Retrieved August 29, 2016. ↑ Wolf, Bob (August 14, 1985). "Tittle never got to the top". The Milwaukee Journal. p. 3. 1 2 3 Wickersham, Seth (July 15, 2014). "Awakening The Giant". ESPN The Magazine. Retrieved May 21, 2016. ↑ "New York Giants". Encyclopedia Britannica. Retrieved August 26, 2016. ↑ "AP NFL Most Valuable Player Winners". Pro-Football-Reference.com. Sports Reference LLC. Retrieved May 23, 2016. ↑ Maule, Tex (November 20, 1961). "The Right to be First". Sports Illustrated. p. 20. Retrieved August 17, 2016. ↑ "An Old Story: The Giants and Tittle". Sports Illustrated. September 7, 1964. p. 48. Retrieved August 17, 2016. ↑ Leifer, Neil. "The NFL's Golden Oldies – Y.A. Tittle 1963 N.Y. Giants, age 37". SI Photos. Retrieved January 15, 2014. ↑ Tittle, Y.A. (August 16, 1965). "A Good Quarterback Has To Be His Own Man". Sports Illustrated: 26. Retrieved August 30, 2016. 1 2 Damon, Bruce (2010). The Great Book of San Francisco Bay Area Sports Lists. ReadHowYouWant.com. p. 269. ISBN 1-4587-7837-1. Retrieved August 30, 2016. ↑ Stewart, Michael (December 5, 2011). "New York Giants: Five Best And Worst Trades In Franchise History". Football Nation. Retrieved August 30, 2016. 1 2 Shapiro, Michael (February 2007). "Fallen Giant". Smithsonian Magazine. Retrieved May 21, 2016. ↑ Mannix, Vin (February 18, 1982). "Y.A. Tittle and his statue". Boca Raton News. p. 1D. Retrieved August 26, 2016. 1 2 Crowe, Jerry (January 28, 2008). "It turned out to be the biggest snap of his career". Los Angeles Times. Retrieved May 21, 2016. ↑ How They Racked Up the Great Tittle. Life. Oct 2, 1964. Retrieved August 30, 2016. ↑ Thurber, Jon (June 21, 2002). "Morris Berman, 92; Tittle Photo Endures". Los Angeles Times. Retrieved May 21, 2016. ↑ "Texas Hall Inducts Eight". The Victoria Advocate. Associated Press. January 25, 1987. p. 3B. Retrieved August 29, 2016. ↑ "Louisiana Honors Go To Y.A. Tittle". Gettysburg Times. Associated Press. February 22, 1972. p. 9. Retrieved August 29, 2016. ↑ Rathet, Mike (July 31, 1971). "Nixon Attends Induction Of Brown, Lombardi, Tittle And Others In Grid Hall Of Fame". Gettysburg Times. Associated Press. p. 9. Retrieved May 21, 2016. ↑ "49ers Announce Edward DeBartolo Sr. 49ers Hall of Fame". San Francisco 49ers. May 12, 2009. Retrieved August 30, 2016. ↑ "New York Giants Retired Jersey Numbers". Big Blue Interactive. Retrieved August 25, 2016. ↑ "New York Giants Ring of Honor". Big Blue Interactive. Retrieved August 29, 2016. ↑ "Y.A. Tittle new QB mentor for NY Giants". Eugene Register-Guard. Associated Press. May 19, 1970. p. 3C. Retrieved August 31, 2016. ↑ "Tittle May Be Ready To Call It Quits". Toledo Blade. Associated Press. December 10, 1964. p. 61. Retrieved August 31, 2016. ↑ Ziegel, Vic (December 14, 1995). "Daughter's book was a true labor of love". Star-News. p. 2C. Retrieved August 31, 2016. De Laet, Dianne (1995). Giants & heroes: a daughter's memories of Y.A. Tittle. University of Michigan: Steerfoth Press. Tittle, Y.A. ; Clark, Kristine Setting (2009). Nothing Comes Easy. Triumph Books. ISBN 1-60078-210-8. Wikimedia Commons has media related to Y.A. Tittle.